Twelve Variations on Ah vous dirai-je, Maman by Wolfgang Amadeus Mozart is a melody source for classical ABC song for children (Alphabet Song), baby nursery rhyme Twinkle Twinkle Twinkle Little Star, and Baa, Baa, Black Sheep, that we also used for creating original lyrics songs for Letters A, B, C, D, E, 123 counting song in English, as well as Alphabet songs of Russian and Hebrew languages. Gangnam Style (강남스타일) is a K-pop single by the South Korean musician PSY, that become most watched music video on the Internet. 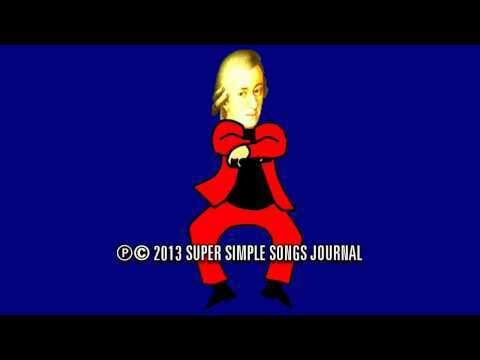 Here (SSS 2013, Volume 5, article 1) we report original music composition in a style of pop music Gangnam style by PSY and classical music composition by Mozart and create new ABC song with original lyrics. Music phrases two, three and four of Twelve Variations on "Ah vous dirai-je, Maman" by Wolfgang Amadeus Mozart (dated 1781 or 1782)  is used as a melody for ABC song for children or Alphabet Song , baby nursery rhyme Twinkle Twinkle Twinkle Little Star , and Baa, Baa, Black Sheep . We used extended parts of Mozart composition for original ABC songs for different letters of English Alphabet, such as Letter B , Letter A, C, D, E songs and English 123 counting song to help little children to master counting to 20, Hebrew Alphabet song and Alphabet song in Russian language (to be reported elsewhere). Here we report original music composition in a style of Gangnam style pop single and classical music composition by Mozart. Original five track score is a part of this original song publication, it is available as a sheet music Adobe Acrobat .pdf document. We also created original lyrics new Alphabet song (ABC song for children) using our original music composition. The copyright holders have licensed the cinematograph, animations, films, photography, sound recordings and packaging contained in audio and visuals at Super Simple Songs Journal for private home or household mobile family video stream use only. All other rights are reserved. Any unauthorised use including, but not limited to, copying, editing, lending, exchanging, renting, hiring, exhibiting, offline storage, video hosting and network uploading, radio or television broadcasting or any other diffusion, or otherwise dealing with the content of Super simple songs journal or any part thereof is strictly prohibited. Learn how Super Simple Songs J enforces our content usage policy. HOW TO DOWNLOAD FOR FREE SUPER SIMPLE SONGS DVDs? Subscription is the only way to download our Super Simple Songs DVD collection for free as described above. Also, once in a while we may email to our subscribers a newsletter with new publications details and exclusive subscribers-only specials. We accept subscription requests by email subscribe at supersimplesongs dot org only. Note: to have free downloads of DVDs you have to supplement email subscription request with a subscription to our channel at youtube, here is subscription link.